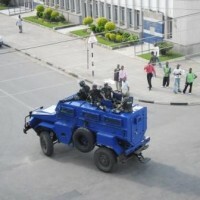 The much awaited Pac meeting, which the government suspects is aimed at regime change, began on Wednesday amid tight security in and around the venue, Limbe Cathedral of the Roman Catholic Church and in Blantyre CDB. Police officers armed to the teeth were manning the entrance to the Cathedral, demanding to know the identities of all individuals before giving them the right to passage. Inside the hall, security was also been tightened as Public Affairs Committee Executive Director Robert Phiri demanded all invited guests to leave the conference hall after the opening session. Phiri said this was the only way to ensure the delegates of maximum security. In his opening speech, chairperson for the conference, Bishop James Tengatenga, disputed the meeting is about regime.